Find drivers to continuously improve the consumer brand preference metric to improve market impact and financial performance. 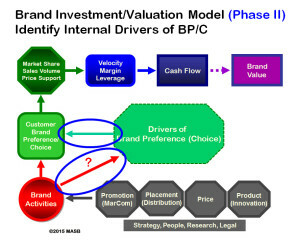 Empirically proven drivers for increasing brand preference/choice & brand value. Marketing and Finance practitioners agree that it is marketing’s job to create, sustain and build brands that produce current and future economic benefits for the firm, recognizing that the brand is one of the most important intangible assets owned by the enterprise. Current methods of brand valuation are divergent, inconsistent, and generally not useful for financial forecasting, planning, justifying investment or improving return.